The loss of innocent lives is truly tragic, while not always avoidable during war. But the fact that Israeli media is discussing, and the IDF is investigating, the tragic deaths of the members of the al Dalou family, brings into sharp relief the stark cultural differences that are making peace in this region so hard to achieve. How many Palestinian/Arab news sources are reporting about the injuries and deaths and damage caused by the rockets coming out of Gaza, let alone with the names of the victims? The IDF continues to try to avoid civilian casualties, and Hamas continues to make that as difficult as possible by storing and firing their munitions from within civilian areas in Gaza (not to mention using medical and media buildings and insignia on vehicles to try and avoid being targeted or, at best, make Israel look bad when it hits these targets). Along with many other people, a couple of friends of mine on Facebook (both moms) have mentioned the basic, fundamental pain and universal “wrongness” of hearing about and seeing dead children. 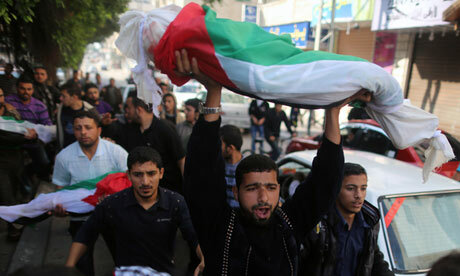 But a piece I heard on the radio (I’ll link to it if I can find it) along with years of historical evidence and images like this one from the al Dalou funeral (photo credit: Wissam Nassar/Xinhua Press/Corbis) point to a culture that exalts martyrdom and elevates the struggle to destroy its enemies above even its own children’s lives. Yes, there are people grieving for these children, and for other innocent lives lost, but grief is not apparent on the face of the man carrying the child in the forefront of that shot. Another thing going around the social networks over the last few days is a Golda Meir line, “We will have peace (with the Arabs) when they love their children more than they hate us.” Golda and other Israeli leaders have said things that are far less enlightened, but this line still rings through and true. May we see peace in our lifetimes.